Looking north at the Paramount Studios backlot. The Hollywood Forever Cemetery appears along the top edge. (C) 2012 Microsoft Corporation, Pictometry Bird’s Eye (C) 2012 Pictometry International Corp.
Click to enlarge. The Paramount Studios backlot. My first post about The Artist filming locations shows that the three different movie theater exteriors appearing in the movie were all filmed at the Warner Bros. backlot. 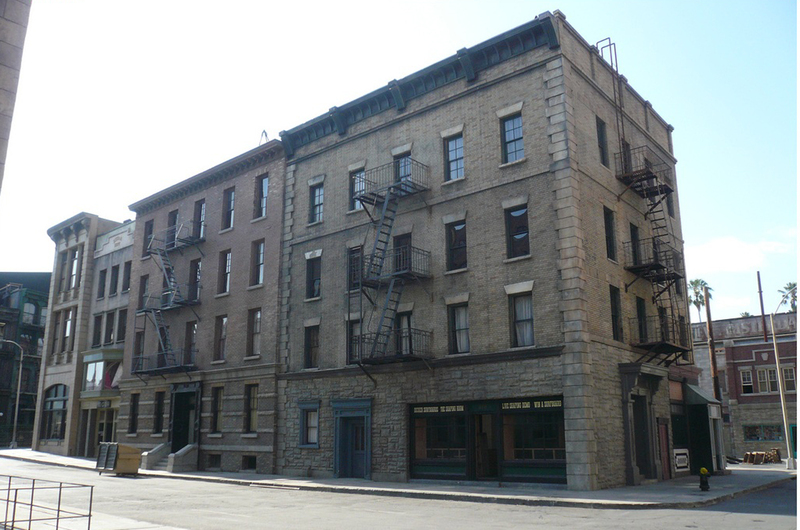 As shown here, apparently all of the other exterior city scenes from The Artist were filmed at the small New York City backlot at Paramount Studios. This post identifies eight different backlot settings, keyed to the map to the left. My very special thanks go to J. Eric Lynxwiler for allowing me to post his wonderful photos of the Paramount Studios backlot. His Flickr Photostream, jericl cat’s photostream, which includes, in part, dozens of beautiful photos of vintage theaters, vintage matchbook covers, and vintage neon signs, may be accessed HERE. We begin with Scene (1), above, as character George Valentin strolls with Uggie the Dog north along the Lower East Side set towards the NW corner of the Brooklyn set. Scene (2) shows George crossing the Brooklyn street, walking north towards a corner men’s shop. Once there, George gazes into the window, and sees his forlorn reflection align with a tuxedo on display, reminding him of happier days when he was a major silent film star. Below, Scene (3), still-prosperous George stops to inspect a banner promoting Peppy Miller’s new talking picture, and realizes it will premiere on the same day as his self-financed silent feature Tears of Love. The movie’s failure triggers George’s spiral of despair. 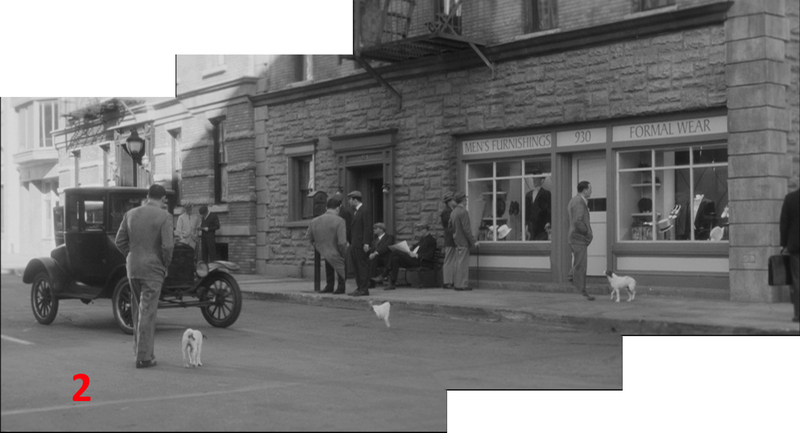 This view looks south-east, at the opposite side of the Brooklyn street set, across from the men’s store (Scene (2)) side of the street. The next two scenes (4) and (5), were filmed as shown on the map to the left. During Scene (4) below, filmed looking south-west towards Washington Square, and the studio water tower (out of view), George turns the corner going north onto the Upper East Side street. 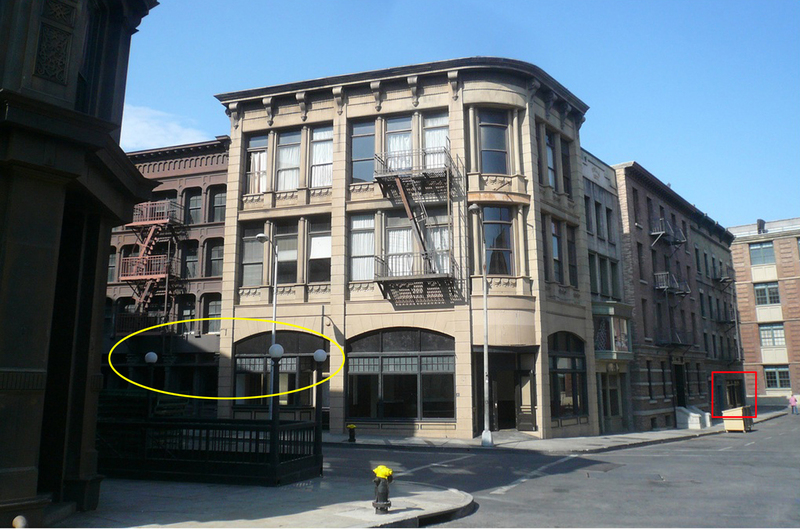 During Scene (5), filmed looking to the southeast, the gap between the Washington Square set, and the Brownstone set (right arrow), was covered with a green screen, and filled with a matte image of the Lonely Star Theater (see below). Scene (4) above, a view looking south at the Washington Square set – the Warner Bros. water tower appears in the color view. During Scene (5) above, looking south down the Upper East Side street towards Washington Square, George leaves the auction house after all of his possessions are liquidated. Unbeknownst to him, Peppy Miller’s servant purchased George’s possessions upon her instructions. Above, the servant leaves the auction house and crosses the street to report to Peppy. This comparison view shows George crossing the gap between the Upper East Side set and the Washington Square set. 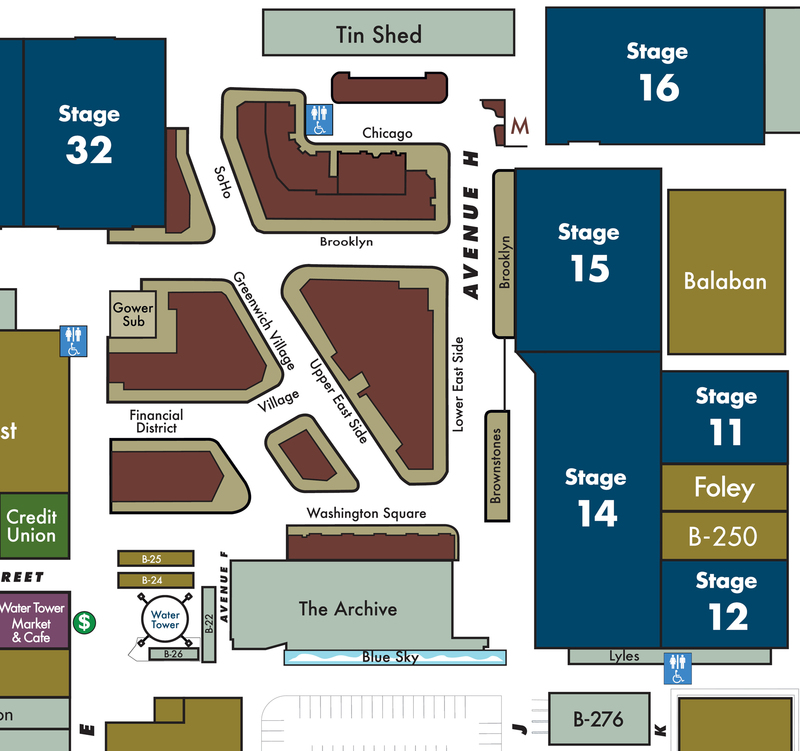 The Lonely Star Theater (oval), “standing” where Stage 14 is located (red box), was a matte image created with the help of a green screen covering up the stage and filling the gap between the sets. During Scene (6) Peppy arrives in Hollywood by bus (left), brimming with confidence following her unexpected publicity in the local newspapers. 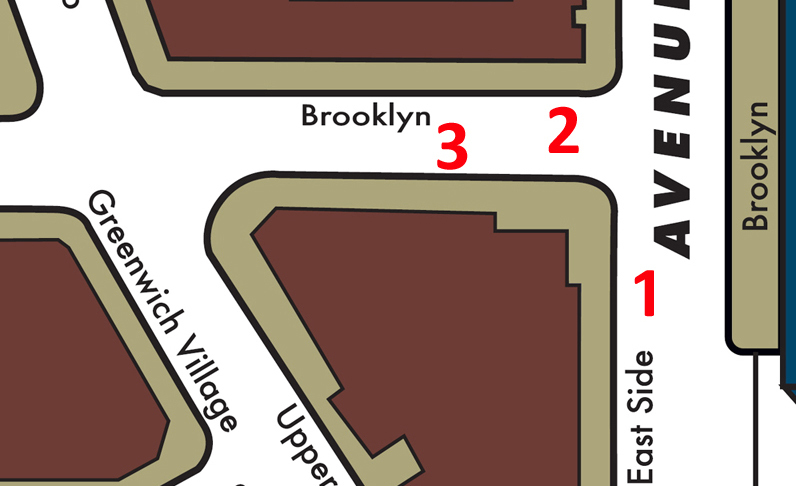 The setting for the bus arrival (see map and photo below), was filmed looking south along the face of the Brooklyn set running along what is called Avenue H.
At the climax of the film, Peppy races her car to George’s apartment, hoping to arrive in time to avert a disaster. Two of my prior posts Number One and Number Seven show some of the true exterior locations appearing during Peppy’s frantic drive. But other race scenes were filmed on the Paramount backlot. Scene (7) below shows Peppy driving from south to east around the corner of SoHo onto Brooklyn. Peppy turns the corner from SoHo onto Brooklyn. The tall buildings at the far left are a matte image. The yellow oval marks the subway entrance lamps appearing in Scene (8) below. 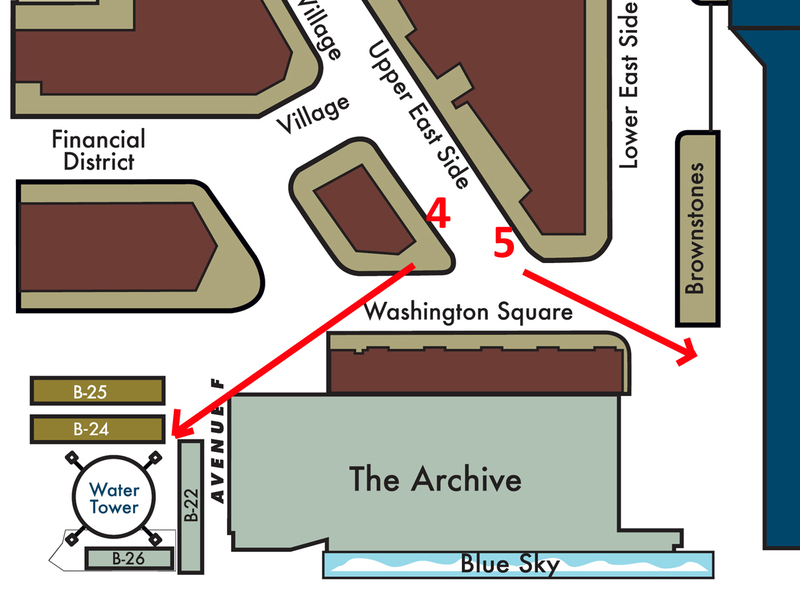 The red box marks the men’s store set from Scene (2). Scene (7) – the yellow oval marks the subway entrance lamps appearing in Scene (8) below. The red box marks the men’s store set from Scene (2). During Scene (8) below, Peppy races around the same backlot corner as Scene (7), only this time the view looks south instead of north. The yellow ovals above mark the same subway entrance lamps appearing during Scene (7). The tall buildings in the background are another matte image, covering up the Washington Square set that appears at the far background in the color image. 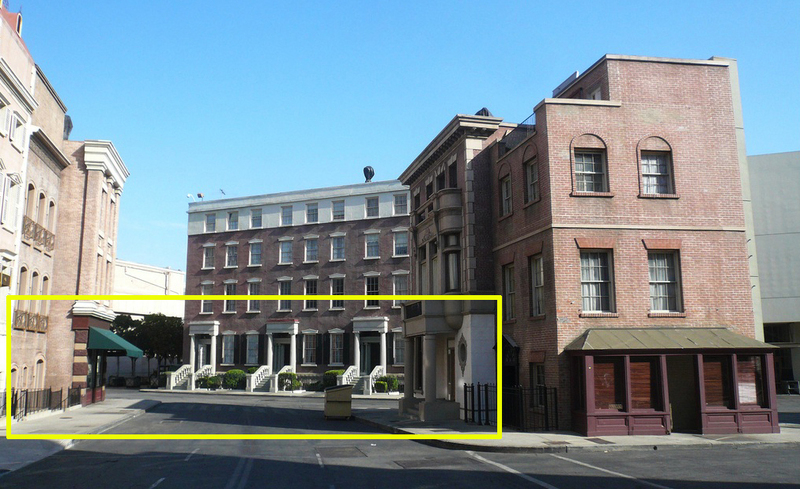 The original Paramount New York backlot was destroyed by fire in 1983, and fully rebuilt in 1992. 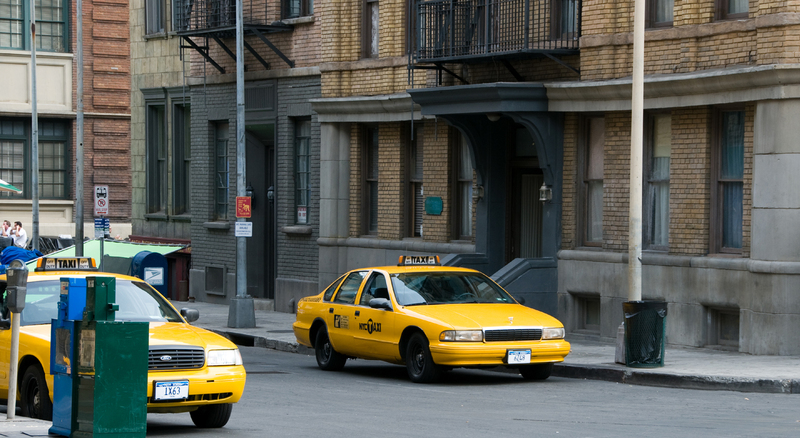 The New York set has appeared in hundreds of movie and television productions, including, by random example, the Coen brothers 2001 film noir feature The Man Who Wasn’t There. 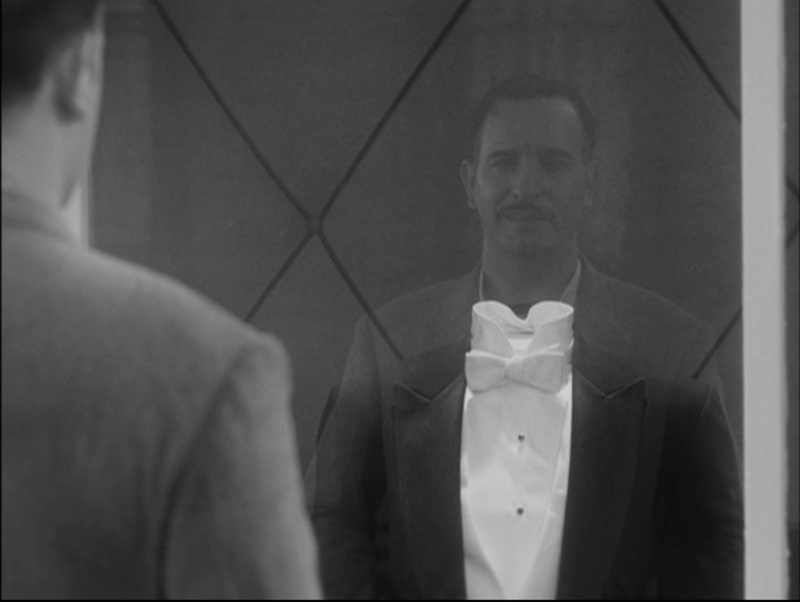 The Artist (C) La Petite Reine, The Weinstein Company. The Paramount Studios backlot map (C) 2012 Paramount Studios, may be accessed HERE. Below, an aerial view north of the Paramount Studios backlot, with the Brooklyn set running left-right across the center. You can expand the image, and zoom in and out, to get a better sense of this setting. 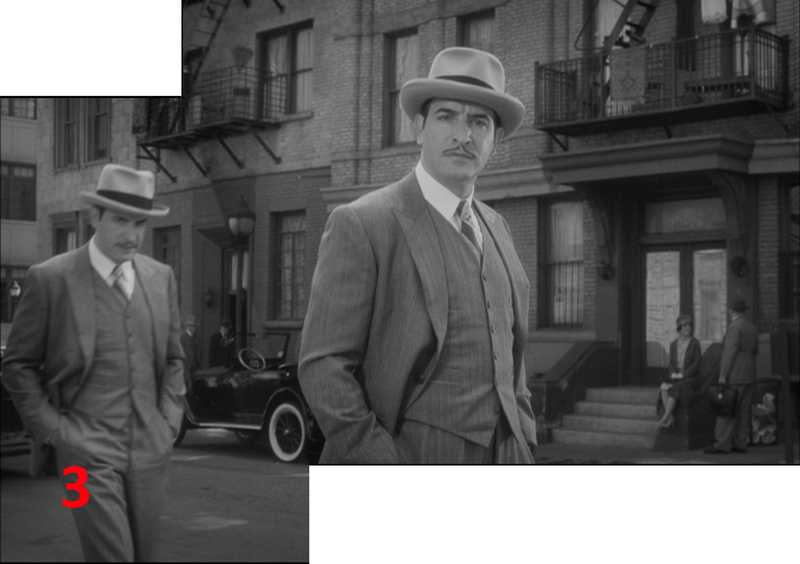 This entry was posted in The Artist, Uncategorized and tagged Hollywood Tour, Paramount Studios, Paramount Studios Backlot, Paramount Studios New York set, The Artist, the artist filming locations, The Artist locations. Bookmark the permalink. NIce. I was just there yesterday! Really cool set!